Do Humans Have the Capacity To Love Unconditionally? 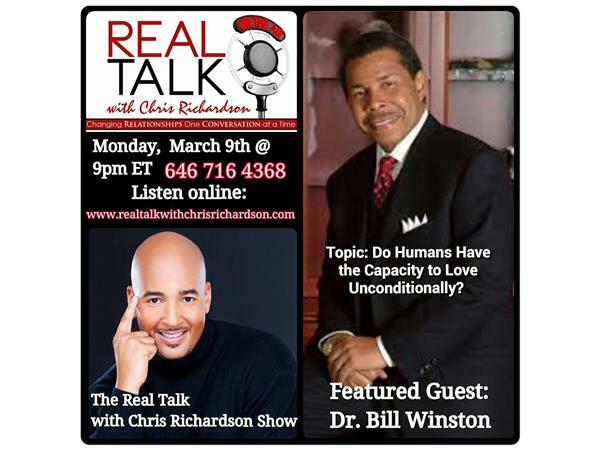 Join in and hear the unadulterated word of truth shared by my special guest: Dr. Bill Winston. 1.Are love, perfect love and Godly love the same? If not, how would you define them? 2.Some say that love is a feeling. Others say it’s a thought or an action. So, is love a feeling, thought, or an action? Is love conditional or unconditional? William (Bill) Samuel Winston Bill Winston is the visionary founder and pastor of Living Word Christian Center, a 20,000 member church located in Forest Park, Illinois, and Living Word Christian Center–Tuskegee in Tuskegee, Alabama. Other entities under his leadership include: the nationally accredited Joseph Business School in Forest Park, with fourteen other partnership locations across the U.S. and internationally; Living Word School of Ministry and Missions; the Forest Park Plaza (a 33-acre shopping mall) and Washington Plaza (in Tuskegee); and Golden Eagle Aviation among others. He’s the founder of Bill Winston Ministries (a ministry outreach that shares the Gospel through television, radio, and other media), and president and founder of Faith Ministries Alliance (FMA), an alliance of 578 churches and ministries under the covering of Dr. Winston in the U.S. and overseas. Bill is married to Veronica and is the father of three, Melody, Allegra, and David and grandfather of eight.